See the island on a stylish Jeep Wrangler, taking in secret beaches, panoramic views and specially chosen spots for an exhilarating 4x4 adventure. Good to know: There is also an amazing jeep tour available departing from Ibiza and taking you across Formentera. Discover some of the most beautiful locations on Ibiza in a top of the range Jeep Wrangler for a fantastically fun 4x4 safari tour day out. Choose a shared or private tours with the option for a self-drive session and get behind the steering wheel yourself to see Ibiza up close and personal. All tours give you the opportunity to see amazing hidden and special places known by few on this exciting day out. See the amazing panorama of the island from its highest point, 475 metres up on a mountain. Take in incredible views of the sea and the mystical Es Vedra from high on the cliffs. Drive down dirt tracks through forest to see an historic defence tower and visit a huge cave where the sea comes in from both sides. A chance to get active awaits, stopping at secret beaches to do a spot of snorkelling or dropping by a special spot to try your hand at a bit of cliff diving. Ending your exhilarating day will be a salute to the famous Ibizan sunset. 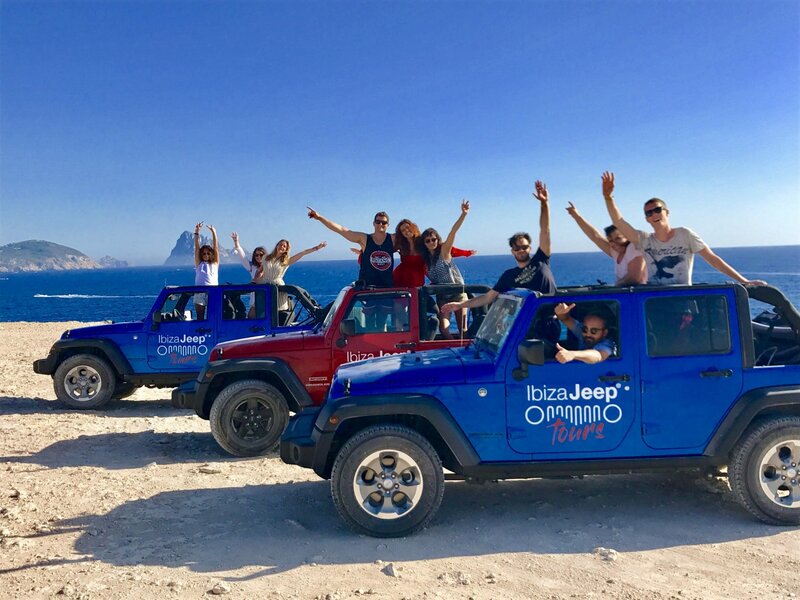 Ibiza Jeep Tours offers top range models, all from 2017-2018, Jeep Wrangler Rubicon 4 doors - 5 seater. All tours include all of the above activities. Check the details of each one below and choose the adventure you want. These trips are ideal for individual travellers or small groups. Pick up / Return times: 11:30/12:00 h. and return 19:30/20:00 h.
If you fancy being in the driving seat, try one of these great trips where you get to drive the cool Wrangler Jeeps yourself. This tour includes a Stand Up Paddle excursion with a qualified instructor to teach you some strokes. Sunset, at an amazing spot, is accompanied with a free cocktail or glass of Cava in hand. Your whole experience will be recorded with a digital photo album to record your day out. For those that want a yummy Spanish-style lunch, get a tasty seafood paella and salad, with bread alioli and olives (drinks not included). A free cocktail or glass of Cava is your partner to see down the sun at a special spot. At the end you will receive your own digital photo album. Adverse weather conditions: In case of rain, the activity can either be rescheduled or refunded. Cancellation policy: If you cancel more than 4 days in advance of your chosen date, you will be fully refunded.